TMD is made up of several disorders that affect the jaw joint and the muscles that control chewing. TMD’s occur as a result of problems with the jaw, jaw joint and the surrounding facial muscles that control chewing and moving the jaw. The disorder can be as minor as slight clicking or popping sensations when the mouth is opened or closed, or as serious as chronic pain extending into the face, neck and shoulders. 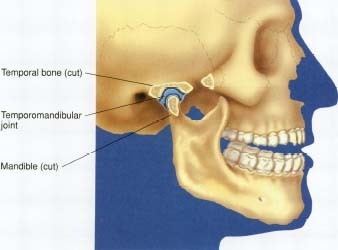 The TMJ is the hinge joint that connects the lower jaw (the mandible) to the temporal bone of the skull, located immediately in front of the ear on each side of your head. These are flexible joints and allow the jaw to move up and down and side to side, enabling you to talk, chew and yawn. Muscles that are attached to and surrounding the jaw joint control the movement and position of the jaw. The exact cause of TMD is unclear, but dentists believe that the symptoms arise from problems with the muscles of the jaw, or with the parts of the joint. WHAT ARE SYMPTOMS OF TMD? Patients with TMD can present with a range of symptoms, and these symptoms can be temporary or last for many years. TMD has show to affect women more frequently than men. Your dentist will conduct a thorough patient history and dental exam, to determine the cause(s) of your symptoms. Sometimes the dentist will also use x-rays, MRI’s and/or CT scans to further analyze your jaw joint. There is a wide range of treatments for TMD, depending on the cause and how severe and frequent the symptoms are. They can range from self-care, “at home”, treatments, to injections and surgeries. Ideally, we prefer to start with the more conservative, non-surgical treatments, with TMJ surgery being used as a last resort treatment. If it is determined that the TMD symptoms are due to you grinding your teeth or due to you having a “deep bite” then the ideal treatment may be a type of custom made jaw splint. This splint is made to help reposition the mandible to a more relaxed position, which in turn helps to reduce the tension in the jaw joint and associated muscles, thus reducing the severity and frequency of the TMD symptoms. If the symptoms are determined to be due to missing some teeth or due to a misaligned or unstable bite, then the ideal treatment is to replace the missing teeth and making crowns or doing orthodontic treatment to gain a more ideal position of the teeth. In rare cases, surgery may be required to treat a TMD. Surgery is the last resort treatment, and is a viable option after other forms of treatment have been tried unsuccessfully. If you experience any of the above symptoms or think you may have a TMD, contact our office for more information.